This ground-floor 1,500 square foot, 2BR/2BA Destin condo has everything you need for your beach getaway. Part of the gated and prestigious Aegean condo community, this newly remodeled unit is just steps from the heated pool, tennis courts, and beach. Take in Gulf of Mexico views from the 600 square foot patio with plenty of seating for your group to dine alfresco and unwind while enjoying the warm ocean breeze. The community sits on Holiday Isle, right in the heart of Destin and close to Norriego Point Park, where you can enjoy easy access to the jetties and the Destin Harbor. You’re also near Harborwalk Village, boasting entertainment, dining, shopping, and watersports. Tastefully decorated with blues and oranges, the living room offers gulf views through the sliding glass doors. It has plenty of seating on a white leather couch and matching armchair around a 60” flat screen, smart TV with cable and DVD player. Whip up meals in the beautiful, gourmet kitchen with well-stocked cabinets, double sinks, granite counters, and stainless appliances. Start your day with a cup of coffee at the large island with seating for three and extra prep space. There’s plenty of seating around the six-person dining table for sit-down meals or family game nights. 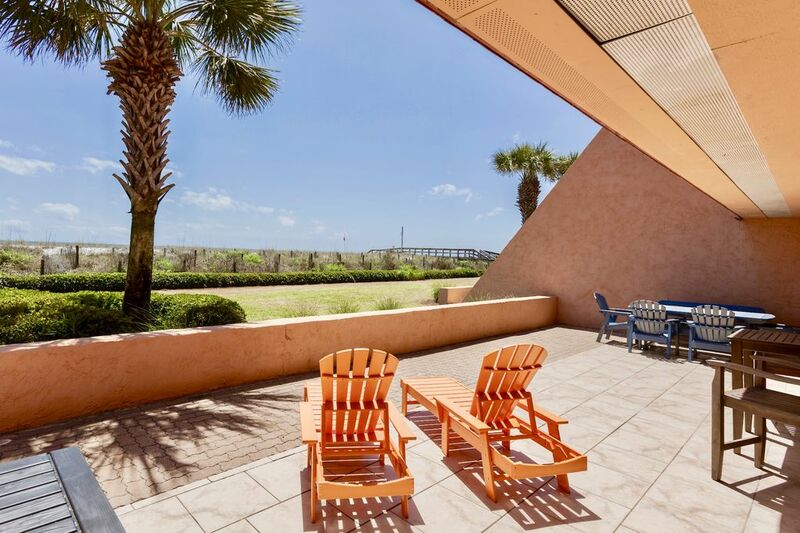 Kick back on the extra-large patio with incredible views of the Gulf of Mexico. Dine alfresco at a six-person patio table or enjoy your morning coffee at the two-person high-top. With two bedrooms and a set of twin-xl bunk beds in the hallway nook, the unit sleeps eight comfortably. The master bedroom has a king bed which looks out the sliding glass doors to the gulf. The master also has two closets, a built-in dresser, and a 32” flat screen TV. The en-suite bathroom offers a large vanity, soaking tub, and walk-in shower with glass door. The second bedroom offers two full-size beds as well as two closets, a built-in dresser, and a 32” flat screen TV. The convenient en-suite bathroom features a dual vanity and a tub/shower combination. The kids will love having their own space in the bunk beds tucked into the hallway nook. Other amenities include complimentary Wi-Fi, a stackable washer/dryer in the unit, and parking for two cars. The gated Aegean condo community has plenty to offer guests, including two tennis courts, a large, heated swimming pool, and pavilion with BBQ grills. The sugar soft sand and emerald green waters of the Gulf of Mexico are just steps away. It’s a 10-minute drive to Norriego Point Park, where you can enjoy easy access to the jetties and the Destin Harbor. Enjoy a night out at Harborwalk Village (7-minute drive), offering restaurants, numerous nightlife spots, and shopping right on the waterfront. It’s also a great spot to rent paddleboards, kayaks, and pontoons to explore the harbor. We a great time at 118. Very homey and easy access to the beach or pool. We have stayed at the Aegean several times and the this has been the most updated and clean unit we have been in. They all were good but this condo sets it self apart. Any questions asked of the owners were followed up with almost immediately. Beautiful spacious place right on the beach. We had a great time and will be back! Fantastic condominium and great location! Fantastic condominium and great location!! Great stay at the Aegean Unit 118 . Very roomy and clean. Short walk to beach or pool. Have stayed years on Gulf Shore Drive and LOVE the Location. 1st stay at the Aegean and Was Not Disappointed. The owners were very friendly and accommodating. With the dunes rebuilt as they were from the 1st floor , You can't see the Ocean but that was Minor and No Problem. If you get Beach service you have a longer walk because the OWNERS who are there get 1st choice of being closest. It was an Awesome Overall stay with my Wife and Mother in Law. I give it a 4 star ONLY because I don't give a Top billing much. Hope this hurricane Michael doesn't flood them out!! This is a gorgeous unit that provided us everything we could have wanted. The proximity to the beach and pool was our favorite part of the location. The comfortable beds and handy kitchen made us feel right at home. Jen did an excellent job with the decor. Thank you for a great experience. After we were evacuated from Hilton Head due to hurricane Florence, we were pleased to have the perfect vacation after all! My family and I travel to Destin every year and this year we decided to stay with Jenn. Her place did not disappoint! It’s my new go to when we visit Destin! Great layout, super easy bean access and convenient to everything. Great owners with a great place. We’ll be back!